Home / Giveaways / FabFitFun Fall Box Giveaway! Welcome To The FabFitFun 2016 Fall Box Giveaway! The FabFitFun Box is a quarterly subscription from FabFitFun.com. I have never been disappointed with any of their boxes in the two years I’ve been getting them. Each season they send you a box of $100+ worth items in categories like beauty, fashion and fitness. Check out what I received in my Fall Box here! The box costs $49.00 each and they ship to the US and Canada. Save $10 Off Your First Box with coupon code SILVIE! With the season of beach days, and BBQ Parties behind us, it’s time to stock up on a fresh batch of Fall must-have goodies! This box is filled with so many amazing goodies and has a total retail value of $239.99!! 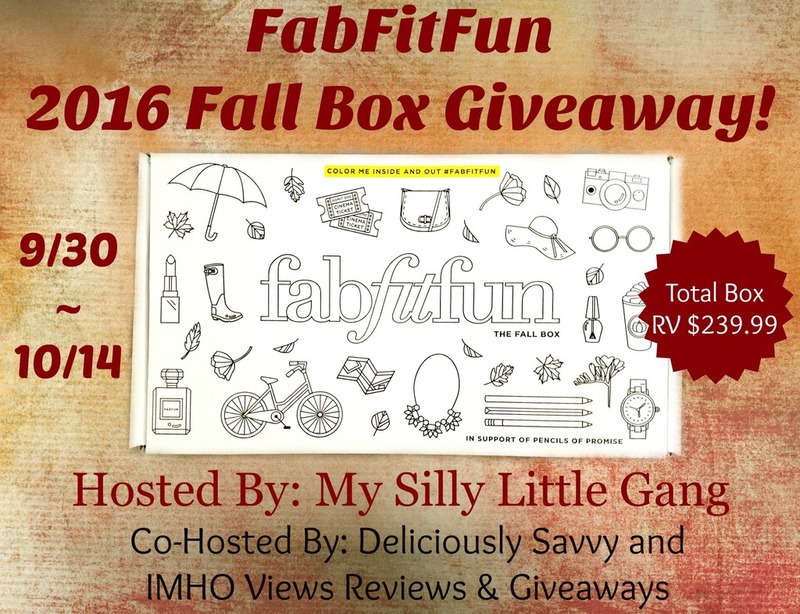 1 LUCKY WINNER will receive the FabFitFun 2016 Fall Box (RV$239.99)! This giveaway will run through 10/14/16 at 11:59 pm Eastern Time and is open to US residents ages 18+. Chances of winning depend on number of entries received. Winner is subject to eligibility verification and will have 48 hours to confirm before a new winner will be drawn. For any questions or concerns please email silvie.mslg@gmail.com (please consider adding this email to your “Safe List” as the winning email notification will be sent from this email.) Please refer to the full terms and conditions in the Giveaway Tools form. This giveaway is in no way endorsed, affiliated or associated with Facebook, Instagram, Twitter or any other Social Media Networking Site. Thank You for stopping by! Disclosure: Silvie at My Silly Little Gang received a complimentary product to facilitate the review, no other compensation was received. Hosts & participating bloggers are not responsible for sponsors that do not fulfill prize obligations. Sponsor is responsible for shipping prize. Thank you for stopping by!